The March for Our Lives is a demonstration that its participants wish they didn’t have to hold. Buoyed by a grassroots student-led movement in the wake of the mass school shooting in Parkland, Florida that left 17 dead last month, kids and families alike will take to the streets to demand that the country do more to end gun violence and ensure students’ safety. With 14 fatal school shootings already behind us in 2018 (and we’re not even through March), the future doesn’t just feel bleak for students, but downright frightening -- and that's why throngs of fed-up young people are taking it upon themselves to spread the message that they should be able to, you know, stay alive when they’re just trying to get through math class. 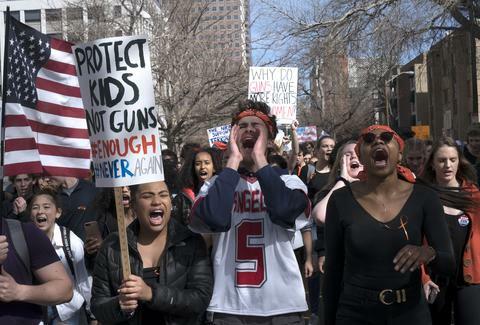 Last week, thousands participated in coordinated national school walkouts. 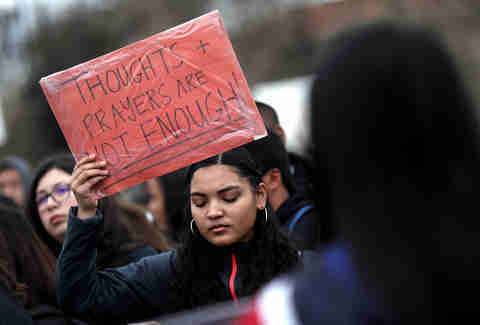 Now, if all goes according to plan, a main rally in Washington, DC (organized by survivors of the Parkland shooting) is projected to bring out a half a million marchers, with tens -- and more likely hundreds -- of thousands more participating in 700 student-led “sibling marches” around the country in cities like New York, Chicago, and Miami. Here’s what you need to know if you want to join the cause in LA this weekend. The march kicks off on Saturday, March 24 at 9am at 603 South Spring Street (which happens to be the address of a Starbucks), in Downtown near Pershing Square. Participants will march through Downtown LA to City Hall, before meeting for the rally at Grand Park; as for the route, it hasn’t been shared yet, so plan to just follow the crowd. The event is slated to wrap up by 1pm. There are actually six other smaller marches happening in Los Angeles County in Santa Monica, Manhattan Beach, Studio City, Burbank, Long Beach, and Santa Clarita; the start times on those vary, though, so you'll want to double-check the details on the one you want to attend before showing up on Saturday. What is the lineup of speakers? Students from Marjory Stoneman Douglas High School will get on the mic to share their thoughts, with additional speakers including Rebecca Mieliwocki (the 2012 National Teacher of the Year under President Obama) and William LeGate, the young entrepreneur who’s been one of the leaders of the #BoycottNRA movement on Twitter. You can also expect musical performances by Charlie Puth, Rita Ora, and others. While we won’t know if the event will draw Women’s March numbers until it happens, at last check, the LA march’s Facebook page had 30,000 users “interested,” while another nearly 13,000 had RSVP’d that they’re attending. No matter what, you’re not going to want to drive your own car. Lyft has publicly announced that it will give free rides to those attending the marches (note that riders under 18 must be accompanied by an adult), but we’ve got to imagine the wait times for gratis rides will be longer than usual. A solid non-automobile option is the Metro Rail, which you can take to the Pershing Square station, an easy five-minute walk to the starting point. You can buy an official March for Our Lives Los Angeles T-shirt at the event for $20 (make sure to bring cash). If you don’t plan to wear it the day of, you can grab one online and receive it after the march. Organizers are urging everyone to sign this petition calling on Congress to pass a law to ban the sale of assault weapons; you can also go a step further by donating directly to the March for Our Lives action fund. Even after the march is over, there are still plenty of ways you can make your voice heard. Ensure that you're registered to vote in California, so you can cast your ballots in the local 2018 elections -- if you're not registered, you'll have the opportunity to do so before the march begins thanks to HeadCount, an organization providing assistance to the democratically-inclined. If you're already registered, you can double down and volunteer with HeadCount to help get others on the same page. Lizbeth Scordo is a food and lifestyle writer who hopes one of these teen march organizers becomes president very soon. Follow her on Instagram @modlizbeth and Twitter @lalizbeth.